Many people experience a dental cavity in a lifetime and when that happens, it is important to get a filling that restores the health of the tooth. In her San Diego dental office, Dr. Adina Manolescu provides tooth colored fillings that fix dental cavities as well as create a cosmetically appealing smile. Composite (or tooth colored) fillings are restorations used to fill cavities in teeth. The composite resin material is appealing to dentists and patients due to its ability to mimic the natural appearance of a tooth’s structure. In addition to their restorative qualities, composite fillings can be used for cosmetic purposes such as changing the size, color, and shape of teeth. What Are Some Advantages of Tooth Colored Fillings? Closely matching a tooth’s natural color and structure. Bonding to the tooth to restore up to 95 percent of the tooth’s original strength. Hardening and ready for use in seconds as opposed to other materials. Any tooth sensitivity is very minimal. They can be used on both the front and back teeth. In order to determine whether a filling is right for you, Dr. Manolescu will examine the tooth in question and decide which material is best to use. Depending on your individual case, the strength, aesthetics, cost, and longevity of the filling may vary. Dr. Manolescu will consider the current condition of your teeth, the size of the cavity, and the location of the tooth before choosing a filling material. Once the decay has been removed, the tooth will be cleaned and a primer applied to the cavity. A bonding agent is then spread onto the open cavity and the filling material is placed inside the tooth. Afterward, the composite resin will be shaped to match the structure of the tooth and is hardened with a curing light. Once the composite filling has hardened, Dr. Manolescu will check your bite and make sure your teeth fit together properly and can withstand brushing and flossing. 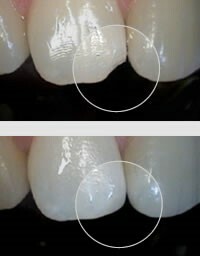 Adjustments will be made if necessary followed by smoothing and polishing your new filling. If you would like more information about the services we provide, or to schedule an appointment with us in San Diego, contact Dr. Adina Manolescu today!